climate change discussions on social media are very influential. A new study in BioScience shows that when it comes to iconic topics such as polar bears and retreating sea ice, climate blogs fall into two distinct camps with little or no overlap between deniers and the available scientific facts. The study's first author, NIOO-KNAW researcher Jeff Harvey says, "It's time for scientists to counter the misinformation and engage directly with the public far more." Polar bears and retreating sea ice have become iconic symbols of the polarised climate change debate. By focusing on these subjects, deniers of human-caused global warming cast doubt among the public about the entire body of climate change knowledge. But a new study of the underlying science used in the debate could well melt down the trustworthiness of these deniers on social media. "We found a major gap between the facts from scientific literature and the science-based blogs on the one hand, and the opinions aired in climate change-denying blogs on the other," says Harvey. "It's a very dangerous gap, as these blogs are read by millions." The researchers analysed 90 climate blogs in total, alongside 92 scientific papers on the subject. Although 45 'denier blogs' claim to be based on science, they failed to overlap with the peer-reviewed evidence in the papers. Instead, they relied mostly on other denier blogs. And 80 percent relied on one blog in particular, whose author, says Harvey, "had neither conducted any original research nor published any articles in the peer-reviewed literature on polar bears." By contrast, 45 truly science-based blogs do match the evidence in the scientific papers. And there's not much middle ground. 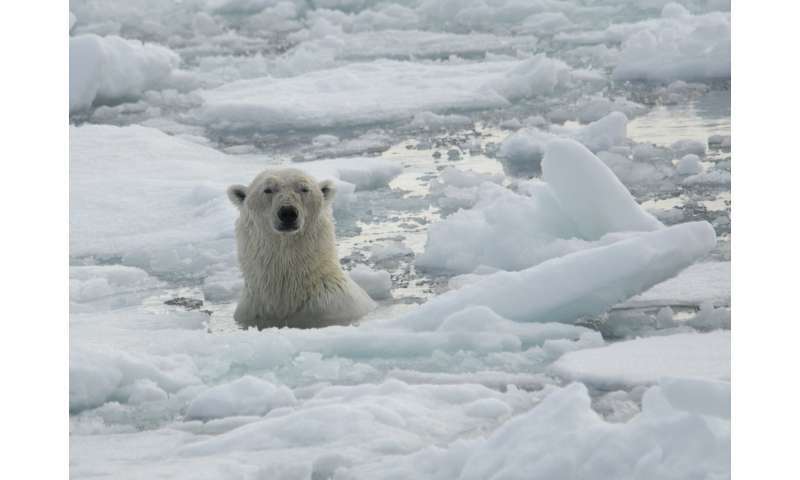 The team that studied the blogs was international and multidisciplinary, including ecologists, polar bear researchers, climate scientists, science communicators and psychologists of various ages from six countries. Among the authors are well-known scientists such as Steven Amstrup from Polar Bears International, Eric Post from the University of California, Davis, and Michael Mann from Pennsylvania State University. Harvey says, "Scientists, climb down from your desk and start to counter the misinformation on social media directly—and via the traditional media, as well. Engage with the public via the blogosphere or citizen science, for example. And very importantly, adjust your focus to what is clear instead of all the uncertain things still to be studied." If the misinformation is successfully countered, the debate may be 'depolarised' while polar bears and other arctic wildlife still have a future to look forward to. What motivates rejection of (climate) science? As per usual, another opinion masquerading as science by Lewandowsky, professor of cognitive psychology. He keeps trying trying to prove that "scientists" and "science" overwhelmingly support the theory of catastrophic anthropogenic global warming instead of examining the actual science. Like Michael Mann, his studies are founded on tortured data and strange statistical manipulations. Critical thinking and logic don't appear to be their strengths. But they're really good at hyperbole. 80 percent relied on one blog in particular, whose author, says Harvey, "had neither conducted any original research nor published any articles in the peer-reviewed literature on polar bears." That blog would be Susan Crockford's Polar Bear Science at https://polarbearscience.com/. Susan Crockford's Polar Bear Science blog is essential reading if you want the facts about polar bears. If you're happy to accept the pronouncements of climate alarmists on the fate of the poor polar bears as the final received wisdom then don't bother reading Crockford. She assiduously documents her blogs with references to scientific studies and ongoing surveys of polar bear populations, providing important perspective that, incidentally, refutes all of the unsubstantiated claims of the alarmists. But if facts and logic aren't your thing I suggest you try Lewandowsky or Mann. They'll get your heart racing. And like any entertaining horror flick all it requires is a little willful suspension of disbelief. And in addition to the above comments you could further point out that "no overlap between deniers and the available scientific facts." should be (to be fair) rewritten as "no overlap between deniers and chicken little's." Well that is the whole point of today's article. Basically - who do you turn to when you want to understand information? Do you depend on one person's very bias blog. Or do you look to the thousands of experts on the subject - who are spending their lives in the trenches - actually doing the science? It really comes down to - 'are you reliant on science - or fake news?' A perfect example - on this same subject (climate - and polar bears) is here - https://phys.org/...tic.html Aksdad as usual (just like Crockford) is immediate and prolific on making pronouncements. But notice that when challenged on the science - goes silent. It is just bias at it's extreme. As a consequence - here in the States - we end up with Trump - who can tell any lie he wants - and a huge segment of our population - cannot evaluate the information.